For your Comfort and Safety and for those who come after you. Most of the huts are privately owned. If we plan to stay in huts, we contact the appropriate organisations for bookings. Fees help maintain the huts. In areas of heavy use, we choose campsites that show obvious use. This concentrates the impact in one area and prevents widespread destruction of the environment. 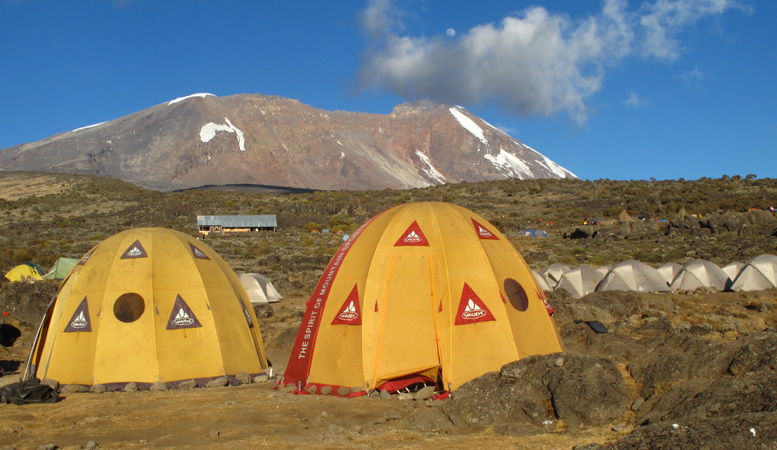 In areas where previous use is not obvious, we camp on durable surfaces such as rock or bare ground, instead of vegetation. Camping at least 50 metres away from water sources helps prevent contamination of the water by human waste. In all cases, we leave the camping area in better condition than we found it. Camp Fires are not permitted in Mt. Kenya National Park. While there may appear to be wood available for fires, the small amount present is an important source of nutrients for the soil and future plant growth. We carry our own camp stoves. With so many individuals concentrated in limited areas on the mountain it is vital to protect water sources from contamination. We purify all drinking water by boiling it. You may feel more comfortable using purification tablets. Never use soap directly in water sources. Even the best biodegradable soaps take several days under ideal conditions to break down. Where possible move at least 10 metres away from the water sources before using soap. Human faecal material is a major source of water contamination on the mountain. Where they exist, use an established toilet (choo). Ultraviolet radiation from the sun and organisms present in the soil are the best decomposers of human waste. At high altitudes those soil organisms are not very abundant. Therefore, sunlight provides the best form of decomposition. Select a site well away from campsites, trails and at least 30 metres away from water, with lots of sunlight exposure. Leave faeces on the surface of the ground. Scattering and smearing the faeces around will maximise exposure to sunlight. At lower elevations such as below 3500 metres where soils are rich in decomposing organisms, burying faeces in shallow holes is the most effective method. Toilet paper and sanitary towels should be packed out with other litter. Buried litter breaks down extremly slowly in this enviroment and is liable to be dug up by animals. Unsightly and unhealthy garbage pits could result which is why we are very attentive to this issue. Burning is illegal. If you have extra supplies, give them directly to someone who will use them. Do not leave them in the huts. Collect uneaten food scraps and pack them out with the litter. Do not feed the animals. Be a part of the Mount Kenya Clean-Up Effort. Bring back more than just your own litter!